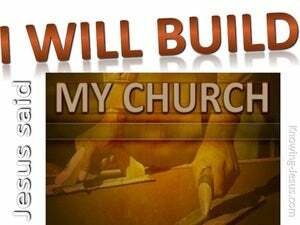 ﻿ Matthew 16:18 "I also say to you that you are Peter, and upon this rock I will build My church; and the gates of Hades will not overpower it. It should be: And I also say to you that you are Peter, and on this rock I will build My church, and the forces of Hades will not overpower it. And I also say to thee, that thou are Peter, and upon this rock I will build my church, and the gates of Hades will not prevail against it. And I also tell you, [although] you are Peter [i.e., a stone], it is on this rock [i.e., the truth you have just confessed] that I will build my church and [not even] the gates of the unseen place of departed spirits will win out over it [i.e., all efforts to stamp out the church by killing Christians will fail]. And I say to you, That you are Peter, and on this rock I will build my church: and the gates of hades shall not prevail against it. And I tell you, that you are Peter, and on this rock I will build my church, and the gates of Hades shall not prevail against it. and I tell thee likewise, that thou art Peter, and upon this rock I will hereafter build my church: and death shall not prevail against it. And I also, I say unto thee that thou art Peter, and on this rock I will build my assembly, and hades' gates shall not prevail against it. And I say to thee, that thou art Peter, and upon this rock will I build my Church, and the gates of Hades shall not prevail against it. But I tell you, your name is Peter, a rock, and on this rock I will build my church, and the powers of death shall not subdue it. And I say also to thee, Thou art Peter, and on this rock I will build my church, and the gates of hell shall not prevail against it. And I say to thee, That thou art Peter, and upon this rock will I build my church; and the gates of hell shall not overcome her. And I say also unto thee, that thou art Peter. And upon this rock, I will build my congregation: and the gates of hell shall not prevail against it. Now I tell you, Peter is your name and on this rock I will build my church; the powers of Hades shall not succeed against it. "Moreover I say to you that you are Petros (a rock), and on this petra (rock) I will build my church, and the gates of Hades shall not prevail against her. 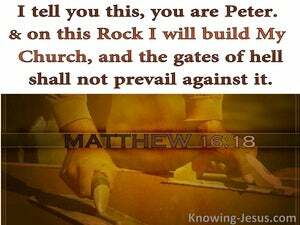 I also tell you that you are Peter, and on this Rock I will build my church, and the gates of hell will not prevail against it. And I tell you that you are Peter [a rock], and upon this rock will I build my assembly, and the gates of hades shall not prevail against it. And, I also, unto thee, say - Thou, art Peter, - and, upon this rock, will I build my assembly, and, the gates of hades, shall not prevail against it. 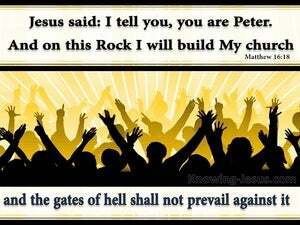 And I tell thee, That thou art Peter, and upon this rock will I build my church, and the gates of hell shall not prevail against it. 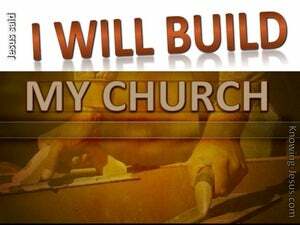 And I say also to thee, that thou art Peter, and upon this rock I will build my church: and the gates of hell shall not prevail against it. And I declare to you that you are Peter, and that upon this Rock I will build my Church, and the might of Hades shall not triumph over it. And I, yes I, tell you, your name from now on is to be Peter, Rock, and on a massive rock like this I will build my church, and the powers of the underworld shall never overthrow it. And I also say to you, that you are Peter, and upon this rock I will build My assembly, and the gates of Hades shall not prevail against it. 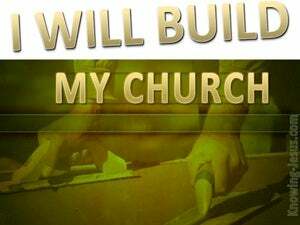 And I also say unto thee, as thou art called Peter, so upon this rock, which thou hast confessed, will I build my church, and the gates of death shall not prevail against it. 17 And Jesus said to him, "Blessed are you, Simon Barjona, because flesh and blood did not reveal this to you, but My Father who is in heaven. 18 "I also say to you that you are Peter, and upon this rock I will build My church; and the gates of Hades will not overpower it. 19 "I will give you the keys of the kingdom of heaven; and whatever you bind on earth shall have been bound in heaven, and whatever you loose on earth shall have been loosed in heaven."